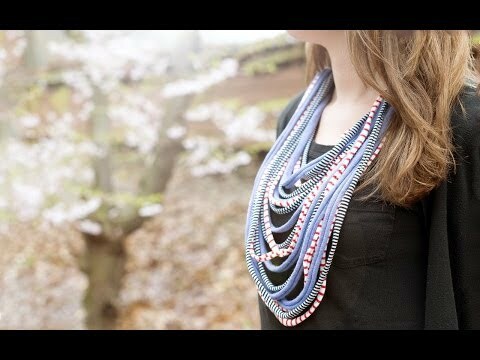 From beachy chic to a night out on the town, this cross between a scarf and a necklace knows no limits. It’s 100% handmade by women in Barcelona, Spain, yet it isn’t too delicate for everyday wear. Lightweight and washable, it’s one of those rare finds that drapes elegantly and wears well even after being packed in a suitcase. Saako founders Oakley Johnson, Ines Brito, Ana Capel, Joana Gouveia call it a scarf-lace, and they were inspired by the idea of reusing the famous ribbed, jersey fabric from the Iberian peninsula into trendy, affordable, unique neckwear. ‘Transform’ was the philosophy of the young designers and over time, their products evolved with more delicacy and style. Each tag shares the story of a woman who made that particular scarf, including details about her life. 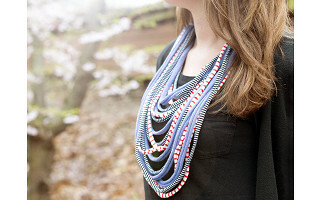 Whether you’re looking for a unique gift or a pick me up for your own wardrobe, this necklace scarf adds panache to any outfit, any time of year. Hello SAAKO fans! Our international team consists of passionate designers, marketers and stylists from Portugal, Spain and the USA. I’ve been with Saako since day one and have been proud to see it grow with a presence in 20 countries around the globe. As you may imagine, I know the products inside and out – so please feel free to shoot me any questions. I know you’ll love your Saako but be warned – while wearing a SAAKO - admirers WILL stop you on the street! @Gary Hi Gary - the materials are all up-cycled using cotton jersey fabrics. No exploitation here and we hire local seamstresses in Portugal and Spain. @Guest Hi Gary - the materials are all up-cycled using cotton jersey fabrics. No exploitation here and we hire local seamstresses in Portugal and Spain. I will be in Barcelona in early June and would like to purchase Scarf-Lace while there. Where can I buy them in Barcelona? Thanks for this question. If your trip is in June, you're most likely to receive this prior to the trip if you purchase on our site. You can then bring with you - just a thought. From beachy chic to a night out on the town, this cross between a scarf and a necklace knows no limits. 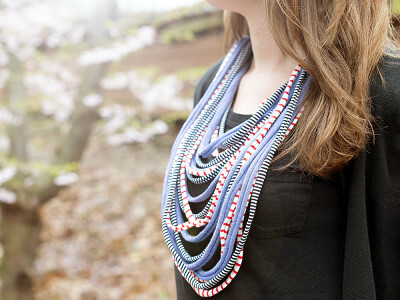 It’s 100% handmade by women in Barcelona, Spain, yet it isn’t too delicate for everyday wear. Lightweight and washable, it’s one of those rare finds that drapes elegantly and wears well even after being packed in a suitcase. Saako founders Oakley Johnson, Ines Brito, Ana Capel, Joana Gouveia call it a scarf-lace, and they were inspired by the idea of reusing the famous ribbed, jersey fabric from the Iberian peninsula into trendy, affordable, unique neckwear. ‘Transform’ was the philosophy of the young designers and over time, their products evolved with more delicacy and style. Each tag shares the story of a woman who made that particular scarf, including details about her life.